TIFFANY JEHOREK PHOTOS (Top) Meeker’s Kate Lockwood, doing the butterfly stroke, on the first leg of her 200 individual medley at the Delta swim meet. (Bottom) Kate Lockwood swam the backstroke during the second leg of her 200 individual medley at the swim meet in Delta. MEEKER | The Delta Barracudas hosted the Delta Open the second swim meet of the season on June 23. The Meeker Marlins had four swimmers competing: Dexter Chinn, Tucker Chinn, Judd Harvey and Kate Lockwood. Each meet is organized a little differently and in Delta the meet was heated by times, not by age and gender. 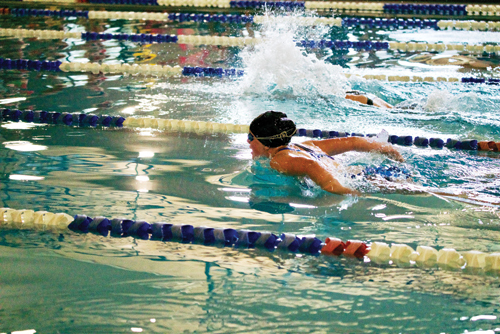 The Meeker Marlins are very competitive against other seasonal swim teams and the swimmers were heated in the fastest for each swim, often swimming together. Competing against other team members is a foreign concept for the Marlins as they vary greatly in age and are mixed gender. Lockwood, who swam with Harvey and Tucker Chinn in the first race, the 200 freestyle, said it was “fun knowing they all got to swim together but would place and score individually.” The meet runs faster when the swimmers are heated together as it cuts the total number of heats needed. The swimmers were able to swim up to four races each and then place and score points individually by age and gender. The Chinn brothers both had excellent meets. Tucker Chinn swam away with firsts in all four of his races and Dexter Chinn left Delta with three firsts and one second. The brothers are very competitive in practice with each other and it is paying off in how they swim their races and showing in the excellent season each is having. Lockwood, who has aged up this year, also swam very competitively, placing second in two swims and third in the other two. Harvey, the only Marlin in his age group, took home a first and two seconds. The Marlins took a weekend off and will travel to Montrose for a three-day meet, swimming as many as 11 races each. The Montrose meet is July 6,7,8 and the final meet of the year before Western Slope Finals. Western Slope finals is a meet that competitors must have qualifying times to swim and some Marlins are still needing their best times to swim a full day at the Western Slope Finals.